There must be more songs written about Donegal than any other place on earth. 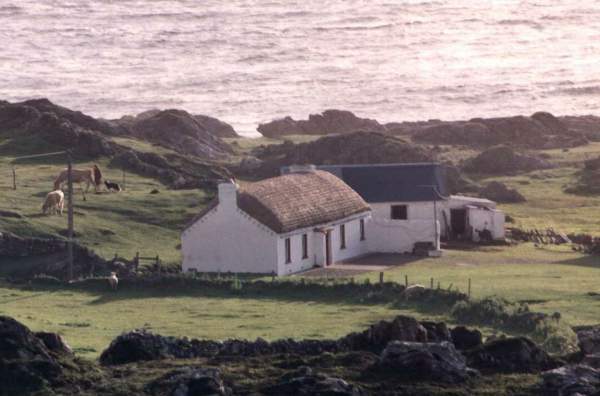 Donegal contains the most northerly part of Ireland (Malin Head) but is in the South of Ireland. 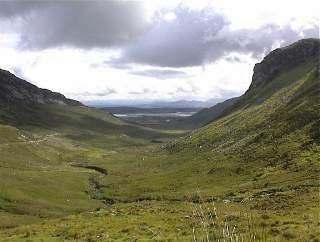 It has wild mountains and a rugged coastline which looks west towards the raging Atlantic. It is probably Irelands most beautiful county. The beaches are spectacular and you can often have one all to yourself. Drive north from Derry just past Inch island towards Buncrana and you could well miss this wee piece of heaven. It's the old Fahan Pier and it's hidden from the road. There's a 7th Century stone pillar in the nearby graveyard. They are building a new marina close by and I hope it doesn't spoil things. And say hello to day. Just two of five beautiful photos Chris aged 19 from Norfolk, England sent me. Chris hopes to move to Ireland in the near future. He's a big fan of Shay Given who plays for Newcastle United and the Republic of Ireland. Thanks David for capturing so beautifully this glimpse of a lifestyle which is fading fast as the "Celtic Tiger" takes Ireland towards a wealthier but faster future. 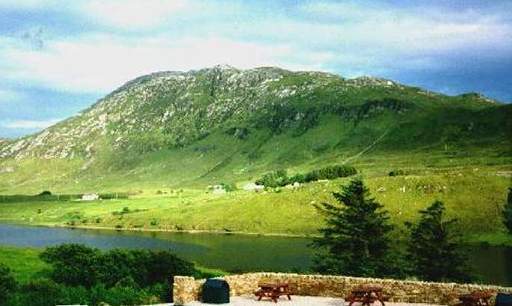 Beautiful Glenveagh National Park is an area of about 10,000 acres. It has it all. 600 red dear and it's open to the public. Farmer returning home from the hillside after working at his turf. 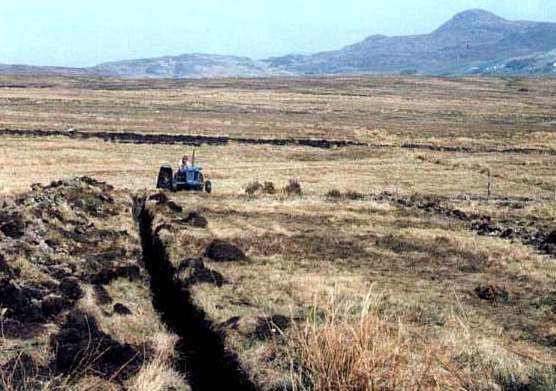 Turf was the main source of cooking and heating fuel in Ireland. It is peat cut out of the ground into pieces about 12 inches x 4 x 4 and allowed to dry. There is a closer photo of the farmer and his turf-stack in the People of Ireland section. It Picture taken on the Innishowen Peninsula near Slieve Snaght. 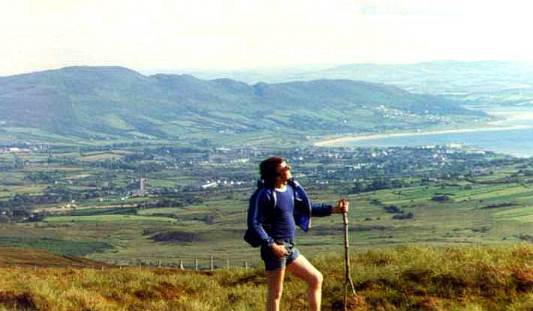 and the popular seaside town of Buncrana can be see in the distance. 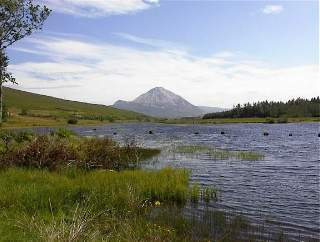 The song "Brennan on the Moor" is about Willie an Irish Robin Hood in the 1700's. I'd be proud to have him as an ancestor. Walking the dog by Billy Cassidy Killybegs is one of Irelands main fishing ports. You will find many big ships entering the harbor, each with its own entourage of calling seagulls. These photos were taken by Billy and Christine my cousin, I believe that's her with the black labrador. To the south of Killybegs, Drumanoo head has a fine view and walks. To the west the mighty Slieve League cliffs plunge down to a dark blue Atlantic. Ive discovered that many Irish people arent sure where Killybegs is, except that most know theres a song about the place. A native once told me that you go to Donegal town and turn left and keep on driving until you nearly drive into the sea, and then stop: thats Killybegs. It was with a Trafalgar Tour that I first rolled slowly into this tiny village suspended between sea and sky. Our extraordinarily tactful Tour Director has mentioned that the aroma from the fish processing plant might be memorable-to-overwhelming, but just to pray that the wind would be blowing the right way. 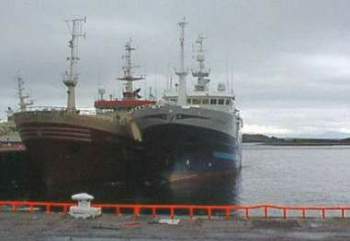 As it so happened, it wasnt the cannery smell but rather the people of Killybegs who completely overwhelmed me with their friendliness and kindness. While everyone else on the tour poured into the local hotel for lunch, I bought a quick pack of oatcakes, and munched them as I rambled up and down the hilly streets, talking to anyone who seemed friendly. When a fast, hard rain sprang up, I took shelter in the deep little doorway-alcove of a shop. And soon afterward, a thin, elderly man popped into my shelter. He wore a old, old navy suit with the lapel pulled up around his neck, and one of those lovely soft, sheltering caps that so many Irish men wear. At his side, he held a lighted cigarette in the ingenious curve of his left hand, to shelter it from the drenching rain. I marveled at how the Irish have learned to do a great many things in the rain, including smoking. He stood and peered out at the downpour for several moments before he saw me in the shadow of the shelter, and it startled him a bit, as he turned toward me. "Wont last long, American miss," he promised cheerily. I loved that he could tell at a glance, even in the shadowy light, that I was a foreigner, and that he wanted to offer some sort of reassurance on this unpredictable Irish weather. But I love the rain, in all forms, so Ireland feels quite a homey place to me. And sure enough, the rain abruptly passed out to sea, and the sun came out in all its November radiance. I parted enriched from my jolly companion-weatherman of the shelter. Climbing to the highest spot in town, I found the Catholic Church, and was mesmerized by the large fragment of a Celtic cross displayed in the front courtyard. How old it must have been. How many lives had it comforted or dismayed over the years, I wondered. So I nibbled my small sack of oatcakes and studied the weathered markings on the cross. Out of nowhere came a discouraged looking stooped man, dressed like a priest. He looked absently at me, and at the cross, and paused. So, not wanting to be inhospitable, I held out the bag and said, "Would you like to share my oatcake lunch?" He too was startled, like the weather man, and paused in some mild kind of distress, but hesitating to walk on. He asked if I was a visitor, and I said just over from America. And then to my utter surprise, he poured out a sad little account of being in Killybegs for a fortnight with his nephew to recover from a very bad and stressful time in his life. I was too surprised to ask for details, and he seemed too distracted to offer any, but he seemed to gain peace from his rambling, vague little recitation. Hed just been down in the town for his tea, he offered as explanation for declining my oatcakes. "I was not meaning to be burdening you with all my troubles," he ventured. "But it was your offering of the oatcakes that seemed to loosen my tongue." He paused, and smiled ever so slightly, and shuffled off to the darkened church doorway, with one shy little, backward lifting of his hand. Heading back to our coach, I tried to memorize the precious details of this isolated little community of souls and oatcakes on the edge of the sea. The gulls lining the peaks of the steep roofs. The faded colors of the shop fronts. The very faint aroma of the fish processing plant. The utterly open faces and gentle hearts of the people who live here everyday, who no doubt eat the oatcakes without noticing how delicious they are, and who probably never even smell the cannery scents wafting over the town at times. Back in America I actually wrote to the bakers address on the oatcake package, and humbly pleaded for their recipe, even going so far as to offer myself as an bakers apprentice and floor-sweeper, should they ever want to be hiring one. I got no reply, but decided to experiment and re-create those oatcakes myself. After all, there couldnt be too many exotic ingredients in them; surely it was just a matter of getting the proportions right. Probably 25 attempts later, I have re-captured Killybegs in my kitchen. I can bake in my own Pennsylvania oven the taste of those oatcakes, the taste of that fishing village. 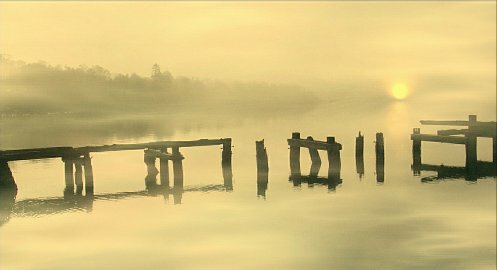 And when I eat them, with scalding hot tea on a misty mild day, if I close my eyes a bit, I can feel myself again in Killybegs, hearing the sounds of those voices that I love so well. I do not know their names, but culinarily, I am connected to them. And comforted. Owen: If you and your wife are ever passing near Pittsburgh, let us know. My husband and I would welcome you to our tiny village of Mars, Pennsylvania. 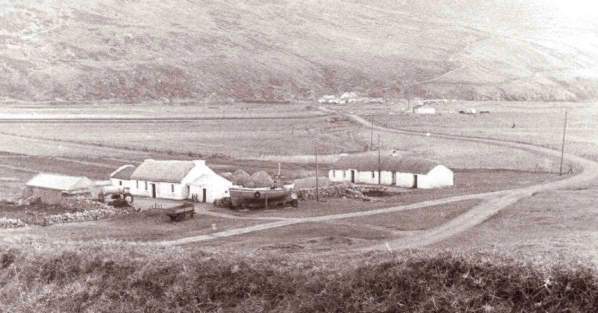 Traditional Irish thatched cottages situated on the west side of the "Gap of Mamore" in the Innishowen peninsula. There is a fine 100 mile drive around the circumference of Innishowen which makes for a really good day out. Fintown is a small town in Donegal on the River Fin. Sally's grandmother, Anna McGeehan, lived there until she was 13 then emigrated to Philadelphia where she lived until her death. As far as it's known the remainder of her family stayed in Ireland. Sally's grandfather, Charles Boyle, was from a small village near Fintown called Doochary. Half of his siblings remained in Ireland. He and Anna both came to the US on the same ship but did not meet until they were living in Philadelphia. They married in 1901. Copyright © 1998 belongs with the original authors. All rights reserved.